PIERRE BALMAIN escorts Her Majesty Queen Sirikit to a private showing of his Autumn 1960 collection at Maison Balmain in Paris, October 12, 1960. Photograph courtesy of Pierre Balmain S.A. SKETCH FOR NUIT A LONDRES. All photographs courtesy of the Queen Sirikit Museum of Textiles. As a participant on a tour to Thailand to study textiles, I had the opportunity to visit the Queen Sirikit Museum of Textiles (QSMT), Bangkok. Among the exhibitions on view was “Fit For A Queen,” a stunning showcase of the wardrobe the legendary Parisian couturier Pierre Balmain designed for Her Majesty Queen Sirikit. This was my second visit to the QSMT and I was again impressed by the quality of the content and installations of the exhibitions. I was particularly engaged by the concept and execution of the new exhibition and was delighted to discover the collaboration between the Queen and her French fashion designer. I had the pleasure to sit down recently with Melissa Leventon, one of the three curators who worked on the exhibition, and dive deeper into the back-story and development of this unique collaboration in fashion involving Thai and French culture. You’ve been working as the Senior Museum Consultant for QSMT since 2006; when did the idea first originate of developing an exhibition and catalog on Her Majesty Queen Sirikit’s wardrobe designed by Pierre Balmain? The idea originated a number of years ago with our director, Piyavara Teekara Natenoi. We began preliminary research on the relationship between Her Majesty and Balmain in 2009 when a team from the museum traveled to Paris and visited the House of Lesage to discuss his work with the Queen. Fortunately, we videoed that interview with François and we have used excerpts from it in the exhibition. In one of our inaugural exhibitions, we used quite a number of the Thai-style dresses made for Her Majesty by Balmain so the logical follow-up was to do an exhibition that focused on the Queen’s Western-style wardrobe. Did Her Majesty gift the Balmain pieces to the museum? Yes. Her Majesty has been donating items from her Balmain holdings to the museum since 2009. Earlier this year we were given another sixteen ensembles and some of those will be rotated into the exhibition in 2018. In addition to Daywear, Evening Dress and Outerwear, did the collection include other components, such as accessories, luggage and archival materials? QUEEN SIRIKIT WEARING Nuit a Londres from Balmain’s Spring 1960 collection. The Queen’s customized version was in Thai silk and had shoulder straps added. It did, yes. We have a number of the hats Balmain designed for the Queen, as well as quite a number of Her Majesty’s shoes. The museum’s collection includes only one or two pieces of the Vuitton luggage Her Majesty used on the tour but happily, we were able to borrow several additional Vuitton pieces from the Royal Household. The archival materials we have in the exhibition are all on loan from Maison Balmain and the House of Lesage—Balmain kindly lent us nine sketchbooks, representing the house’s regular summer collections from 1960-1969, and Lesage lent us a number of the embroidery samples prepared for Her Majesty’s dresses. What were some of the challenges in readying the collection for exhibition? Research and object selection are always lengthy and painstaking. For this project, we had a lot of information and photographs of some ensembles, and very little information for others. So we had both to determine how to choose among many options and make good choices where we had few options. Dating the ensembles for which we had no external information was quite challenging until we were able to see the Balmain sketchbooks lent for the exhibition by Maison Balmain, which happened fairly late in the process. Those sketchbooks were key to our understanding of how the Queen worked with Balmain in the early years of their collaboration, and they challenged a lot of the assumptions we had made. Fortunately, they arrived in Bangkok before the catalog went to press! We were also fortunate that many dresses were in very good condition, but getting them to look right on their mounts is always challenging. The evening dresses and ball gowns are all on invisible mounts, which our conservators had to make for each dress individually. That was an arduous and time-consuming task. Can you describe the process that went into the making of the audio-visual components that accompany and complement the exhibition? A lot of time and effort went into the short animated presentations that show selected dresses putting themselves together. We commissioned five of them, and worked with a professional animation studio and designer/dressmakers. The designers replicated the patterns Balmain’s workrooms had used in constructing each garment, by studying the garment closely and taking careful measurements. The animators then translated the patterns into computerized form, and created a series of storyboards—just as if they were making a movie—that showed the shape of the pattern pieces and the order in which they were sewn together. We went through several drafts of each one, adjusting the views, construction order and pacing each time. So, a lot of work, but well worth it. The finished animations are not only informative, they are among the most popular features of the exhibition. Why did Majesties King Bhumibol Adulyadej and Queen Sirikit decide to commission the renowned Paris couturier Pierre Balmain to design Her Majesty’s wardrobe for their 1960 state visit to fourteen European countries and the United States? AFTERNOON DRESS AND COAT, made entirely of Thai silk was worn both in New York and Rome during 1960 state visit. In that era, royal women and wives of heads of state commonly patronized either well-known fashion designers from their home countries or French couturiers. Her Majesty’s principal Thai dressmaker, Urai Lueumrung, advised her that there were no designers in Thailand in 1959 who were capable of producing the kind of Western wardrobe she would need for the tour, so a French couturier was the obvious choice. Balmain was an excellent choice for Her Majesty. He was experienced, widely traveled and had dressed other noble and royal clients, so the Queen knew that he would be able to advise her on the intricacies of royal dress protocol for European countries. Moreover, his couture operation was then one of the largest in Paris, so he had the capacity to produce Her Majesty’s orders quickly and reliably. The Thai government had proposed that Her Majesty work with Dior and offered to pay for the Queen’s wardrobe. Their Majesties wisely declined the suggestion, as well as the payment offer. Dior was the largest and best-known couture house in Paris at the time, but Christian Dior himself had died and Yves Saint Laurent was at the helm. Saint Laurent was a great designer but he was very young and more interested in his generation’s youthful tastes than he was in classic style—not what Her Majesty was looking for. What were the characteristics of Balmain’s designs that Her Majesty found so appealing? Balmain was known for elegant, classic designs—neat little suits, chic afternoon dresses and flowing, romantic evening dresses, all executed with close attention to detail. He was also willing to use Thai textiles in his designs for the Queen to help convey a sense of her Thai identity through her Western clothes. This, I think, was crucial to the success of their working relationship. In the exhibition and catalog texts you make reference to the “seamless blend of Asian aesthetics and European high fashion” that Her Majesty and Balmain “developed and refined over their twenty-two-year collaboration.” This partnership resulted in a “fashionably Western and distinctively Thai” style. Can you talk about some of the pieces in Her Majesty’s wardrobe you feel best illustrate this concept? EVENING DRESS of Thai silk and metallic brocade, 1960. This is one of several simple, Western-style evening dresses Balmain made for the 1960 tour. There are many. The Queen’s daytime ensembles from the 1960 tour, particularly the fashionable suits made entirely from Thai silk, exemplify the marriage of Western fashion and distinctively Thai textiles that created her characteristic style. Two of my favorites in this category are an orange Thai silk skirt suit that Her Majesty wore at least twice during the tour and for several years afterwards; and a Thai silk dress and swing coat ensemble, also worn in both the U.S. and Europe. Balmain also made evening dresses for the Queen in 1960 using this same approach, but substituting Thai gold-metal and silk brocade for the Thai silk. The 1960 tour wardrobe firmly established Her Majesty’s style as utilizing this joint Thai/Western strategy. It carried over to her use of the Support Foundation’s village-woven textiles beginning in the 1970s, which were styled into Western garments by Balmain. It also applied, in a slightly different way, to Balmain’s work on Her Majesty’s Thai national dress. Modern Thai national dress was developed at Her Majesty’s behest for the 1960 tour. Stylistically, it incorporated modern Western tailoring with elements drawn from nineteenth-century and early twentieth-century Thai court dress. Initially, it was made only by the Queen’s Thai designers. However, Balmain and the embroiderer François Lesage began to make some of Her Majesty’s national dress around 1963, adding European construction and embroidery technique, style and materials. What was the reaction of the public and the press to the Queen’s style? Was she considered to be as fashionably and elegantly dressed as other women of royalty and position to whom she was introduced on the tour? The Queen, who was stunningly beautiful, attracted a lot of admiring public attention and was very popular with the press as well. A lot of the press coverage focused on what The New York Times rather breathlessly referred to as the “huge and wonderful wardrobe of fairytale proportions” and there is no doubt that she could hold her own with the most fashionable women in the world. She was elected to the Best Dressed List in 1960, which also included Princess Alexandra of Kent, Audrey Hepburn and Jacqueline Kennedy. She was re-elected to the list twice more, topping it in 1964, and then was elevated to the Best Dressed Hall of Fame in 1965. What role did the House of Lesage play in developing a design aesthetic for Her Majesty? Was imagery for the embroidery drawn from both European and Thai sources? THAI NATIONAL DRESS of silk brocade, shows how the House of Lesage enhanced the garment’s woven pattern with lavish embroidery, 1979. Lesage’s embroidery designs for Her Majesty’s dresses often reflected his signature use of varied combinations of materials to create richly textured surfaces, which in turn influenced Thai embroiderers. I think, in fact, that Lesage’s major contribution to the Queen’s evolving style was the successful application of his distinctive approach to embroidery to Thai national dress. Lesage used both European and Thai sources for the embroidery on Her Majesty’s Western cocktail and evening dresses. Many of Her Majesty’s most formal clothes from the 1960s use both European materials and motifs. However, others incorporate classic Thai motifs, such as flames, palmettes and lotus flowers. 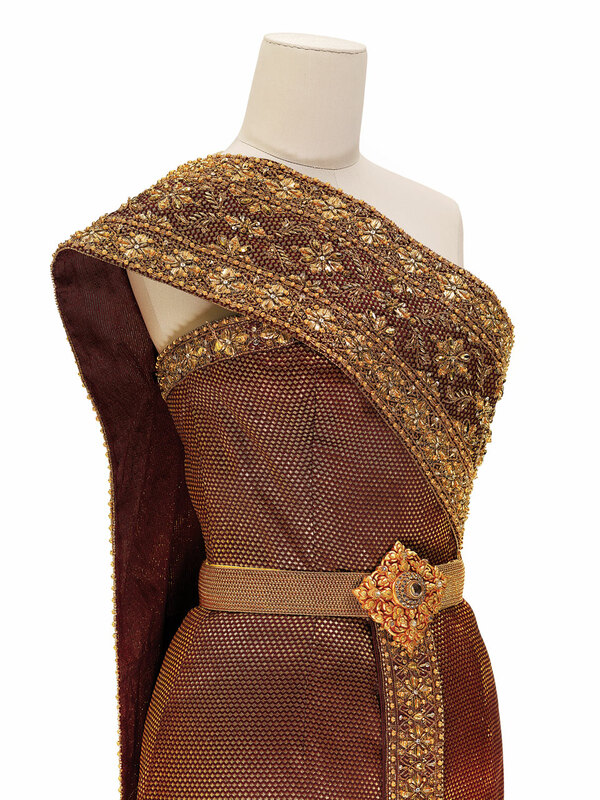 For dresses made of Thai brocade, Lesage’s embroidery often echoes the brocade pattern as a way of amplifying it. The Lesage archives also include copies of motifs from books on Thai art so he plainly was looking beyond the information gleaned from the textiles themselves. As cited in the exhibition catalog, Balmain provided every conceivable service to assure that Her Majesty’s wardrobe on tour met his high standards of craftsmanship and carried “the stamp of enduring elegance.” Can you share with us some of the preparations involved? In addition to designing Her Majesty’s clothes, Balmain provided matching hats as needed. His in-house furrier also designed her furs. Balmain commissioned her footwear from René Mancini, a French custom shoemaker who supplied bespoke shoes to a number of couturiers, and he orchestrated the purchases of accessories such as gloves. Balmain was also very involved in making sure the wardrobe functioned properly on tour. Their Majesties were constantly on the move, especially during the American portion of the tour, and the Queen often had to change three or four times a day. It was crucial that the right clothes for the right occasions be easily findable and always in ready-to-wear condition. To ensure this, Balmain developed a chart for the women who were responsible for caring for the Queen’s clothes during the trip, which listed each outfit, its individual components, the number of the trunk in which it was packed, and the occasion(s) for which it was intended. The list included swatches for easy identification. Balmain also taught Her Majesty’s attendants to pack the clothes so that they would appear fresh and unwrinkled when they were unpacked. Did Balmain present sketches and fabric swatches to Her Majesty for approval? We think so, although we have not yet located any. Erik Mortensen, Balmain’s assistant, mentions in his memoir that Balmain introduced new design ideas to Her Majesty using sketches and samples, and we have seen Mortensen’s own sketches and swatches for Her Majesty from the period after Balmain’s death. How were personal fittings handled? As would have been customary for a royal client, Balmain went to Her Majesty for fittings. It was and is customary for a couturier to have a customized dress form made for each client to be used as a stand-in when the client was not present, so Balmain would have used the form made to Her Majesty’s measurements draping, cutting, and the preliminary fittings in Paris. For the state tour, Balmain brought the clothes needed for the intensive month in the U.S. to Bangkok along with his assistant Erik Mortensen, and a fitter. They spent about three weeks fitting the clothes on the Queen, and did most of the necessary alterations in the workshop of Urai Lueumrung, Her Majesty’s dressmaker. For the second, European phase of the tour, which lasted for five months and was much less intensive, Balmain and his team would visit the Queen almost every weekend at Their Majesties’ base in Switzerland to fit the clothes needed for the following week or so of official activities. Why did Balmain contract with Vuitton to make the trunks with customized interior fittings for Her Majesty’s wardrobe? VUITTON HAT TRUNK. The Vuitton luggage ordered for Queen Sirikit was striped with the colors of the Thai flag and monogrammed with the Queen’s cipher. Vuitton is known for its customized luggage and boasts a long and impressive roster of royal and noble clients. They were really the logical choice. And it made sense for Balmain to order the luggage rather than leaving it to the Palace to do directly, because Balmain would have known which interior fittings were needed to accommodate the royal wardrobe and how many pieces of luggage would have been needed. Who, if anyone, assumed the role after Balmain’s death in 1982? Erik Mortensen, Balmain’s primary design assistant, became the designer for Maison Balmain after Pierre Balmain’s death. Mortensen had been in charge of Her Majesty’s orders since 1960 and thus the two already had a close and longstanding working relationship. I think that for the Queen, the transition from Balmain to Mortensen was probably fairly seamless. When Mortensen left Balmain in 1990, Her Majesty followed him to Jean Louis Scherrer. He remained her couturier of choice until his death in 1998. After that, the Queen tried several other European designers—Dior, Givenchy, Valentino among them, and also increased her patronage of Thai designers such as Bha, Tirapan and Pichita. You point out that the use of handwoven Thai silk brocades and ikats in Her Balmain-designed wardrobe were a deliberate strategy conceived by Her Majesty to promote Thai identity and elevate the textile arts of Thailand. In the 1970s, Her Majesty established the Support Foundation to promote the revival of Thailand’s traditional crafts, particularly weaving. Do you think the Foundation was a natural outgrowth of this strategy? RENÉ MANCINI SHOES made for the Queen in a variety of materials. The Queen often wore this type of evening pump with Thai national dress. Not exactly. The establishment of the Foundation, in 1976, simply formalized an effort spearheaded by the Queen that had been underway for several years. So I think the strategy was born from Her Majesty’s desire to market the silks that were being produced at her behest in the most effective way possible. In other words, I believe the textiles came first, and Her Majesty’s decision to wear them followed. One of Her Majesty’s objectives, through the Support Foundation, was to create a commercial market for the fabrics woven by local village women. Do you think the commercial channels have enabled these “humble village textiles” to now become fashionable? They are certainly popular in Thailand, and I think that is due to Her Majesty’s advocacy. However, they are not particularly prominent in fashion outside Thailand, so I don’t think they have achieved the lasting international recognition that Her Majesty may have hoped for. What would you like visitors to “take away” from this exhibition? I’d like people to understand something of the process of how Balmain and Her Majesty worked together, how important a factor Her Majesty’s appearance and style was in the success of the 1960 tour, how deftly the Queen exploited fashion to raise Thailand’s profile internationally, and how beautiful she looked. I’d also like people to appreciate how hard she worked to raise the profile and reach of Thai textiles. at the Queen Sirikit Museum of Textiles, Bangkok, Thailand. Visit their website at www.qsmtthailand.org. Jo Lauria is a Los Angeles-based curator, author and educator who is a specialist in the fields of craft and design. She has explored objects and environments that define the American lifestyle and culture through publications and exhibitions. The organizer of several museum-based surveys and national touring exhibitions, Lauria is currently the adjunct curator of the American Museum of Ceramic Art (AMOCA). Additionally, as Mentor Faculty at Otis College of Art and Design, she has guided students in their artistic pursuits and has contributed meaningfully to the academic environment. 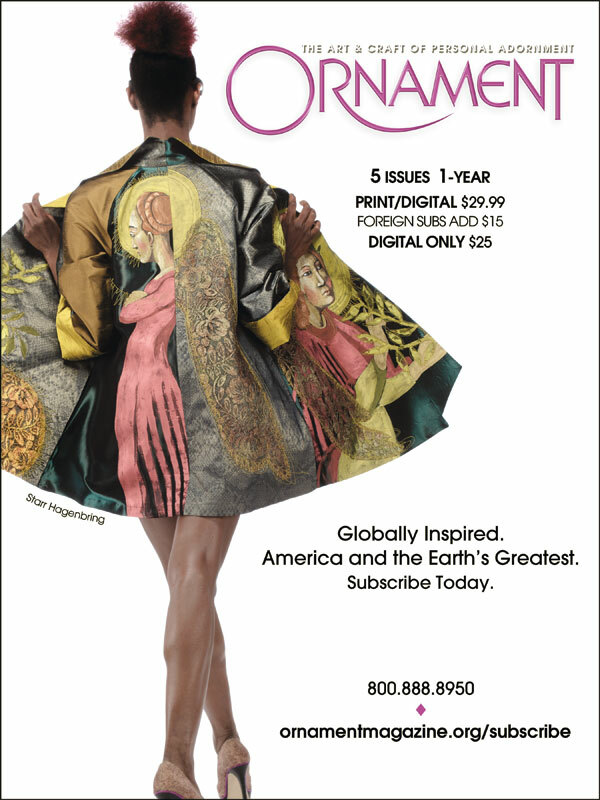 This issue she contributes a rare interview with Melissa Leventon, guest curator for “Fit For A Queen,” an exhibition showing at the Queen Sirikit Museum of Textiles. Together they examine the collaboration between French couturier Pierre Balmain and Thailand’s Queen Sirikit. Melissa Leventon is a specialist in European and American costume and textiles, and has been a consultant to the Queen Sirikit Museum of Textiles since 2006. Author of two books, she has also contributed to many exhibition catalogs and journals. Leventon is based in San Francisco, California, where she is principal of the museum consultancy Curatrix Group and a Senior Adjunct Professor teaching fashion history and theory at California College of the Arts.